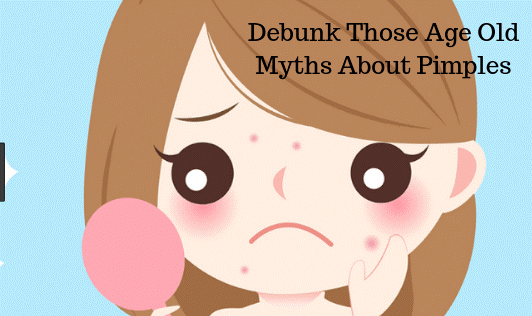 Debunk Those Age Old Myths About Pimples! Almost everyone gets something called acne, sooner or later in life, you might call them pimples or zit as well. Nobody wants them but they are part of growing up! When pimples start appearing so does bits of advice on how to deal with them. But are they all true? Popping pimples clears them faster- Popping a pimple may reduce it temporarily, but squeezing it actually pushes the bacteria further into the skin and worsening it. Popping also causes it to stay longer forming scars. So it's best not to fidget with them even if you are tempted. You get pimples when you workout- True, when you workout, the sweat, and dirt gets trapped on your skin and causes pimples, if not washed. Make sure you wash your face after your workout to avoid pimples. Toothpaste will help you clear pimples- Maybe it will help you clear a pimple, but avoid using it. Toothpaste does help you, but it also makes your skin dry and inflamed. Chocolates are terrible for your skin- According to studies, no specific food causes a pimple, but still, in general, having chocolates which are high in sugar and fat is not recommended from a health perspective. Even though there are no specific studies to support the effects of chocolates on the skin, some people do notice breakouts after having certain foods. Adults don't get pimples- Like teenagers; adults are equally prone to pimples. The cause of pimples in them is usually hormonal imbalance and stress. Masturbation causes pimples- This is a false antiquated notion and not based on any scientific evidence. Shaving causes pimples- Shaving doesn't cause pimples and what looks like pimples to you is nothing but ingrown hair. Getting tanned helps you get rid of pimples- Although a tan can temporarily mask pimples; it also increases your risk to melanoma and damages your skin, which is not recommended. Avoid using makeup for clear skin- Although makeup does block the oil glands; there is no need to avoid it completely. You can use non-acnegenic or non-comedogenic beauty products. But, if you are prone to severe acne, consult your dermatologist to know what is best for you. Next time you see a big painful bump on your face, just leave it alone. Only if you think it's getting worse, consult your dermatologist.